You can't go wrong with this classic Chanel handbag. 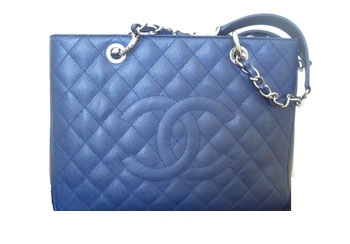 In serene blue color, this bag has quilted caviar leather with Silver Hardware chain and leather straps, signature 'CC' logo gracing the front and open pocket on back. The interior boasts two open and one zip compartments, along with open and zip pockets on the black canvas cotton lining.